DLNA is an industry protocol for sharing media among devices. It first appeared in JRiver Media Center 14.0. You will need to enable Media Network in MC's Options. 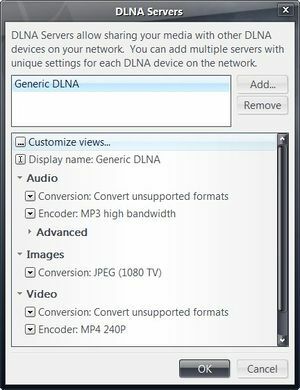 In most cases, you can just set the DLNA / UPnP Server to "Generic DLNA". XBox and PS3 are exceptions and selections for these are available in MC15 and above. DLNA is a super-set of UPnP, which previous versions of MC supported. Our UPnP Server is a "Device" (#1 above). More information on UPnP can be found in the article on UPnP Server. MC14 introduced a DLNA renderer and controller, in addition to the previously existing DLNA Server (formerly known as the UPnP Server). The controller can play media from the DLNA server to another copy of MC or to a device. 1. Go to Tools > Options > Media Network and turn on the functions you need in each copy of MC. Normally, this would be the controller and server on the machine you're playing from, and the renderer on the machine you're playing to. If you're not sure or you have trouble, turn on all 3 DLNA options on the right side. 2. Add a Server in Tools > Options > Media Network. Usually "Generic DLNA" will work, except if you have a PS3, XBox or Sony TV (see below). 3. If you want to use MC as the renderer, start the copy of MC that is running the renderer. Or turn on any device you want to use. 4. Restart the copy that is running the controller and server. In a minute or two, MC will display any renderers it finds under Playing Now. Select the one you want. Then drag a file to it. This should play on the remote device. 5. 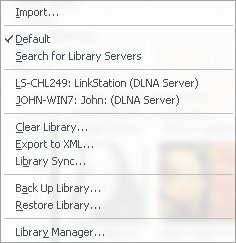 DLNA Servers are displayed under File > Library. Once you select one, you can browse its library as if it were a normal MC library. 1. Go to "Tools > Options > Media Network > Add and configure DLNA servers..." dialog and click the "Add" button and select "Sony BD/TV". 2. With "Sony BD/TV" highlighted in the top window, select Video Conversion: Always convert and Encoder: MPEG2/DVD PAL stream if your TV is PAL or MPEG2/DVD stream if it is NTSC. Many Bravia TVs work with either PAL or NTSC setting. 3. If you are using PAL in step #2 above, click on "Advanced" and change the "Video DLNA Override:" text to read MPEG_PS_PAL rather than MPEG_PS_NTSC. Dismiss the dialog with Ok.
4. Right-click on the Bravia TV item under "Playing Now" and select "Associate with DLNA server" from the menu and select the "Sony BD/TV" item from the sub-menu. 5. Drag a video file onto the Bravia TV item under "Playing Now" and select "Play". In MC16 and later, both Renderers and Servers will be found under Playing Now in the tree on the left. It may take a minute or so for the devices to show up. Media Renderers will appear under Playing Now as zones about a minute after MC is started. 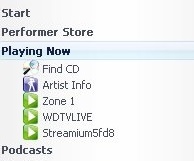 In the screenshot below, the WDTV Live and the Streamium are renderers, and Zone 1 is the local machine. When a renderer is selected, any playback will be sent to it. In MC16, both Renderers and Servers are under Playing Now. Two DLNA Servers are shown in the list below (from MC15's File/Library). Selecting one will open it as a library in MC. In MC16, the DLNA Servers will be found under Playing Now, along with the DLNA Renderers. The Buffalo Linkstation shown is a NAS drive that includes a DLNA Server. Any media moved to the drive will automatically show up in the MC library after the library is opened. 1. You need to find the public Web Radio streaming URL. Sites like these for the US  and Australia  let you browse the Radio Stations and copy the streaming URL. 5.After a moment the station will begin to play and you’ll see the station listed in the library under Audio > Connected Media > My Connected Media. Right click and click Tag or just Alt+Enter to rename the stream. 7.On Gizmo, connect to the server and select the playback zone. Tap Playlists and select your "Streaming Radio" playlist then the required Streaming Radio. After a moment the Gizmo app will show the Playing Now Screen. You can also push the Streaming Radio station to other DLNA renderers. 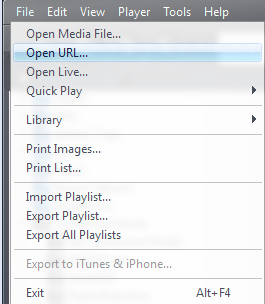 Note: There seems to be several formats for Streaming Radio and some of these links don't work with all DLNA renderers.